Could be up to six changes for the Roosters. A third of the team potentially out, due to injury or suspension. Quality players possible out for North, Scrappy. Hender, Ramsey, Clisby, Tropiano, Castree, Schwarz. Some quality in those names. 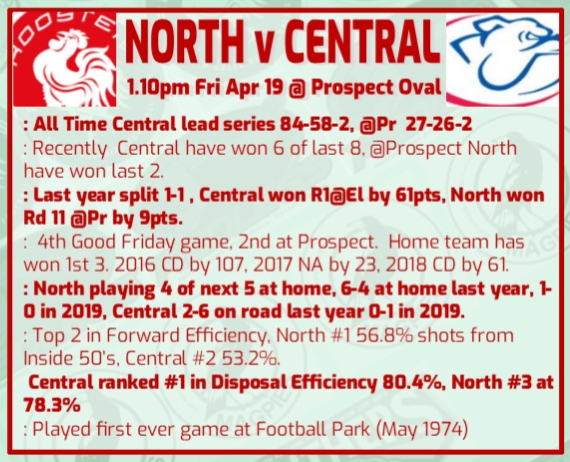 North Adelaide has made five changes for its Good Friday match against Central. The Roosters’ attacking power has taken a hit with Alex Barns (concussion), Lewis Hender (suspension) and Jake Neade (knee) all unavailable for selection. Neade is undergoing scans on his knee but is expected to miss around 2-4 weeks after experiencing restriction in his knee. Former captain Mitch Clisby injured his hamstring against Port in Round 3 while Frazer Driscoll has been sent back to the Reserves. Premiership defenders Tanner Smith and Mackenzie Slee will make a welcome return while Ben Jarman and Jared Deep will add some ball-winning ability through half-forward and the midfield. Goalsneak Strato Agorastos (23, 175cm and 73kg) has been rewarded for his consistent form in the Reserves, with the Payneham Norwood Union junior booting five goals in last year’s Reserves Grand Final. Chapman, Kirk, Wharton, Szekely, Driscoll, Verity, Maroney, Harrington, Minervini, C.Barns, Lower, Nixon, Tiggemann, Ginever, Hilder, Rigney, Coleman-Oakes, Neagle, Bowman, Langley, Hart. Central will unveil another recruit when it tackles North at Prospect Oval. Matthew Neagle – the middle sibling of the three Neagle brothers – has been named to start on the wing. Measuring in at 185cm and 80kg, Matt Neagle spent part of last year training with Essendon before seriously injuring his elbow in a marking contest. The 21-year-old has been joined in the Bulldogs’ 22-man squad by former Magpie goalsneak Michael Ortiz (20, 171cm and 71kg) and key defender Nick Madden, who has recovered from a finger injury. Isaya McKenzie and Jaxon Neagle have both been ruled out with shoulder injuries. Barreau, Burton, Cotgrove, East, Falkenberg, S. Furnell, Llewellyn, Mahoney, Montgomerie, O’Brien, Payne, F. Pisani, Rigney, Robinson, Shaw, Sheppard, Slade, Smit, Spence, Theodorakopoulos, M. White. We will still have to play very well to win doesnt matter how many North have out they are always tough to beat at Prospect. Good game to watch and a good win at Prospect.Liked the fact that we didnt chip the ball around backwards & sideways.We look a lot better side when we move the ball forward and only go sideways to change direction.Menzel was outstanding.Hopefully we will continue play the same way.